A few years ago when Spanish tennis ace Rafael Nadal suffered a back injury his future career path was uncertain, but a certain French businessman named Richard Mille believed in him, and now Nadal is ranked no. 1 in men’s singles in the world. The investment for the avant-garde watch brand has definitely paid off. Nadal just won the U.S. Open, the final grand slam tournament of the season, wearing the Richard Mille RM 27-03 Tourbillon created in his honor. To play, let alone win, the U.S. Open while wearing a watch would have been unthinkable. Nadal, winning the intense competition “serves” as the perfect testimony for Richard Mille. The innovative use of lightweight materials was first developed for use by Formula 1 drivers. The victory at the U.S. Open marks a record of 16 Grand Slam titles for Nadal and Mille is basking in the glory as well. While Federer is strictly a Rolex man, and one of the iconic Swiss brand’s most influential ambassadors, Nadal has brought Mille into the limelight. Whether or not you think the Richard Mille RM 27-03 Tourbillon is an attractive timepiece, you must admire the technical expertise that goes into making a watch that can be worn in a grueling a competition such as the U.S. Open Men’s Final. Mille is unrelenting in his quest for excellence and hence nothing but a tourbillon will do. 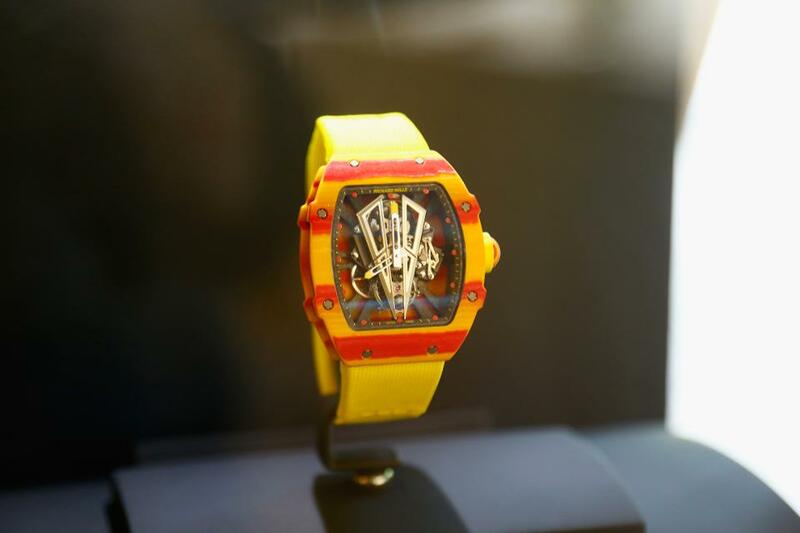 The somewhat garish red and yellow case of the Richard Mille RM 27-03 Tourbillon3 is a homage to the colors of Nadal’s native Spain. The materials on the watch include carbon, silica, resin and quartz. The crown is shaped like a tennis ball and only 50 pieces of the watch will be available to the public, namely collectors. Is The Richard Mille RM 27-03 Tourbillon Too Extravagant? While Richard Mille timepieces remain on the outer edge of taste, style, and affordability, the company says it cannot produce enough pieces to meet demand, but does not wish to ramp up manufacturing, preferring to remain exclusive and expensive – “extremely priced” as Mr. Mille himself puts it. The $725,000 is a ridiculous price tag, but if Mille can get 50 customers to shell out – collectively that makes $36 million and change – he will have the last laugh. Certainly, Audemars Piguet, which owns a 10% stake in Richard Mille, won’t be complaining. Other celebs who wear Mille watches include Jackie Chan, Natalie Portman, Sylvester Stallone and Pharrell Williams, and the diversity of those names is an indication of Mille’s ability to adapt to various tastes as long as those tastes tend toward the extreme.